The Mind of a Helmet Camera Cyclist: Amsterdam here I come! Taking part in the The War on Britain's Roads documentary was an interesting experience. I've described elsewhere that it could have been better, and how it could have been better. However, what's done is done, and it's time to move on. That began when I received an apology from one of my YouTube haters, who then went on to write an excellent guest blog for me. It demonstrated that all was not doom and gloom. The good news doesn't end there though. I can exclusively reveal as an indirect consequence of taking part in the documentary, I have now been invited on a short trip to Amsterdam. (Insert huge cheesy grin here!). Not only that, but that trip will involve sitting on a bike, riding around that fair city and investigating the cycling infrastructure. No, I will not be wearing lycra. Yes I will be wearing my helmet and have my helmet camera on. Yes. You are absolutely right, I will look completely out of place wearing a helmet with a helmet camera on in Amsterdam. Me, riding to work... if I lived in Amsterdam....and I grew my hair long. One final question please.... What's that? Who has invited me to Amsterdam? Ah, there is an interesting answer to that question. It's the BBC. I was in the Netherlands last summer. It was a pure delight to see so many people of all ages on bikes, wearing normal clothes and no helmet. The driving standards, especially on the motorways is no better than in Britain. But I was so impressed with the Dutch cycle lanes that I'm learning Dutch with the intention of moving there, hopefully soon. Good stuff. Unfortunately, Amsterdam isn't the most revealing place to visit to learn about Dutch infrastructure. 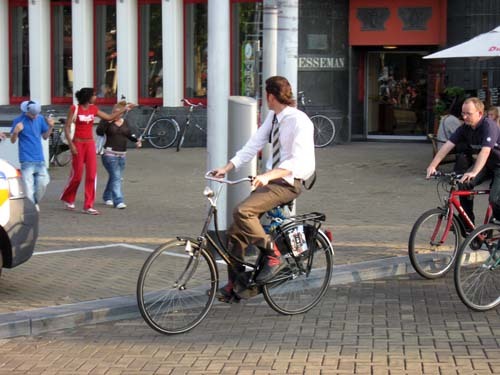 By Dutch standards, cycling infrastructure there isn't really the best. Also, since the historic city centre is anyway not that accessible to cars, it can give the false impression that Dutch cycling infrastructure isn't that much about segragation, whereas that is rather the exception. I'm sure David Hembrow might be more than happy to assist you guys in your expedition -- have you given any thought about this?